A new study paints a picture many of us would be happy to ignore. It is one that illustrates the hazardous effects of alcohol, all around the world. For starters, it causes more than 200 different diseases. The study comes from Canada’s Centre for Addiction and Mental Health. Researchers there have a grave warning: alcohol has become the world’s third most common cause of disease and injury. This is all the more amazing when you consider that most people don’t drink alcohol at all. The 200 different diseases linked to alcohol include obvious things like liver disease and car accidents (due to drunk driving) and things you might not even consider—like breast cancer. 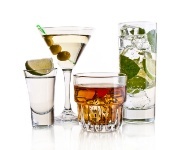 RECOMMENDED: Alcohol and diet drinks are an especially toxic combo. • Those in Eastern Europe and Southern Sub-Saharan Africa were found to abuse alcohol the most dangerously. In general, they drank the most, drank to get drunk, binged for days and weeks on end, and drank alcohol while not eating at the same time. • On the flip side, residents of South Asia, the Middle East, and North Africa consumed the least amount of alcohol. • In North America, adults drink somewhere in the vicinity of 50% above the global average and have more dangerous drinking habits than most of Europe. The study found that alcohol caused about five percent of the global burden of disease. As one of the world’s worst contributors to disease, it’s only surpassed by smoking and high blood pressure. Unwinding with a glass of wine or two is a small pleasure a lot of us enjoy after a busy day. But binge drinking and dangerous drinking are major parts of social behavior. If you fall into this category, know that you are inviting in what is the third-biggest cause of disease in the entire world. Don’t fall into a trap: you’re more likely to drink when you’re stressed out. Instead, turn to your family and friends for help, and limit yourself to one or two drinks a day. Shield, K., et al. “Global alcohol exposure estimates by country, territory and region for 2005—a contribution to the Comparative Risk Assessment for the 2010 Global Burden of Disease Study,” Addiction published online March 4, 2013.